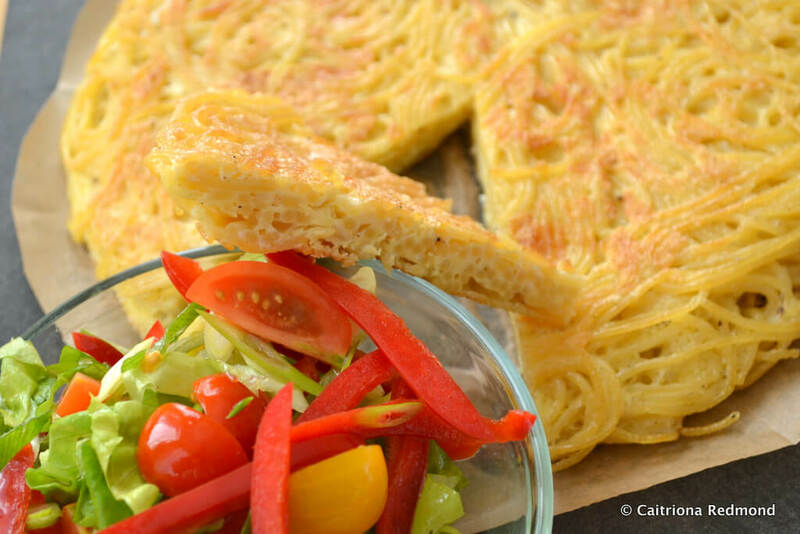 My kids love how visually appealing this baked spaghetti omelette is. It’s low on ingredients, which means it’s easy to make, this also means that you can add any sort of side dish that you like. We prefer to eat ours with a fresh chunky salad. Perfect hot or cold, if you don’t finish it all at dinnertime, chill once at room temperature and eat the omelette for lunch with a dollop of mayonnaise on the side instead. Cook your spaghetti in a large saucepan of boiling water for the time specified on the packet. At the same time, crack the eggs into a large mixing bowl and stir with a fork. Add a small amount of seasoning at this stage if you like. Preheat your (fan) oven to 190 degrees Celsius. Pour the sunflower oil into a large oven-proof dish then place it directly into the oven. To stop it from spilling when you take it in/out of the oven, rest the dish on a baking tray. Once the spaghetti is cooked, drain away the water. Put the hot (drained) spaghetti directly in the bowl with the eggs; stir until the spaghetti is coated with the egg mixture. Open the oven and pour the omelette mixture into the oven-proof dish. Close and bake in the oven for 20 minutes before serving. Consider adding onions, peppers and maybe some bacon to the omelette mixture before cooking if you’d like to change the texture/flavours. Hi just wondering what I could substitute in place of the egg as we have dairy and egg allergies. Hi Vivian, I’m afraid in this case the omelette couldn’t be made without using eggs. I’m not familiar with using egg replacement, sorry about that. Thanks, I’ll have to substitute with tomato sauce, lovely quick recipe. Caitriona I came to your site today as my grocery spend is out of order. I was just thinking about sharing my great pasta omelette with you and te dah you have it already. I make mine in a cast iron frying pan and tip it onto a plate and back into the pan to cook both sites. I suggest adding a big pile of grated parmesan cheese to the eggs – really good.